The US-backed operation to liberate western Mosul from ISIS terrorists has caused a surge in civilian deaths and displacement, according to the UN, while Iraqi security forces tighten refugee screening process' to prevent jihadists from escaping. 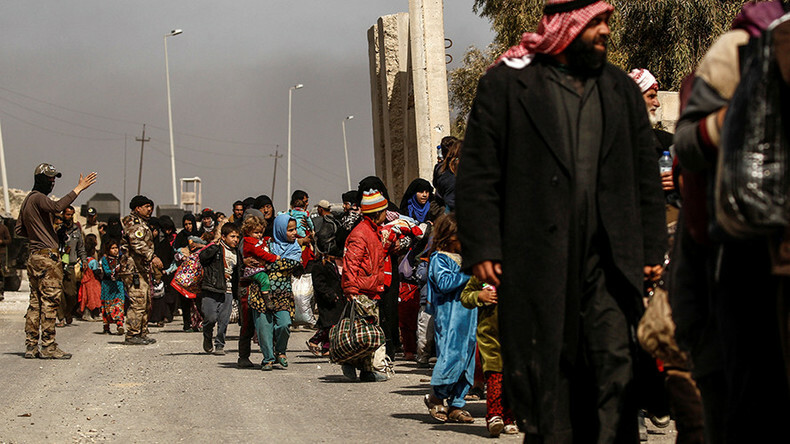 Intensified fighting in western Mosul has resulted in a dramatic surge in civilian population displacement with 12,700 people fleeing the battle zone over the past two days alone, the United Nations Office for the Coordination of Humanitarian Affairs (OCHA) said. Humanitarian situation worsens, as fighting approaches more densely populated areas of the city. 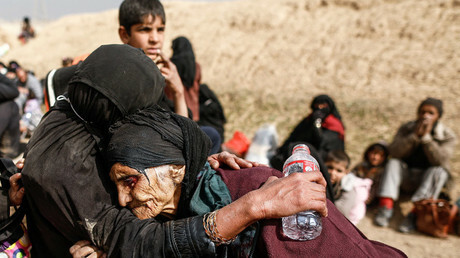 “So far today [Tuesday], we have around 300 displaced people – men and women and children,” Iraqi Brigadier General Salman Hashem told AFP, speaking only about one checkpoint. With the support of the US-led coalition, Iraqi forces began the operation to retake western part of Mosul from Islamic State [IS, formerly ISIS/ISIL] on February 19. Government forces have recaptured several areas on the southern outskirts of the city, including the international airport area, an army base, and two southern neighborhoods. “They're coming to us after days without food,” Hashem said. The escaping civilians also become twin targets; for coalition airstrikes and IS jihadists, who deliberately shell and snipe the fleeing residents. “We were hungry all the time… Our families and children were starving as well we could not get out because of the airstrikes and the mortar attacks,” a displaced man from Mosul told RT. The situation in the besieged neighborhoods is reportedly disastrous, with soaring food prices. A serious shortage of basic supplies also means that even if you have cash, in some parts of the city, money cannot buy anything. Some refugees claimed that they had to leave behind bodies of their relatives who had died from hunger at their homes. “There was nothing to buy. You have money but what can you do, eat money?” an elderly man, who escaped western Mosul told Reuters. The ongoing battle will inevitably result in further civilian casualties, believes political analyst Chris Bambery. “We keep hearing of a breakthrough, but clearly there’s no sign that this battle is going to come to an end. It’s dragged far longer than the Iraqi government and the Americans have believed it would. 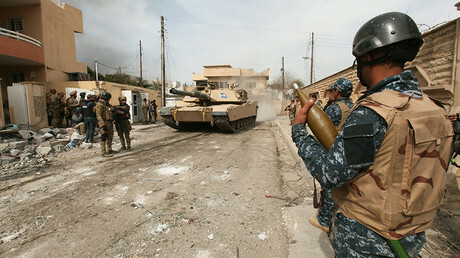 It’s becoming a very serious war of attrition which can create very bad civilian casualties,” he told RT. — RT (@RT_com) 17 февраля 2017 г. “We are talking about a potentially very serious humanitarian disaster,” Bambery stressed. So far only 85,000 more people can be housed within prepared emergency camps and shelters, while some 400,000 civilians can potentially flee the battle zone as the offensive continues, according to UN estimates. UN’s humanitarian partners have prepositioned various assets to help displaced civilians, namely 41,700 tents, 49,000 kits of “basic household items,” and 77,000 “emergency shelter kits.” Despite such preparations, the situation remains quite “challenging,” OCHA said. — RT (@RT_com) 19 февраля 2017 г. Even though humanitarian organizations have enough place to allocate refugees so far, the housing process goes quite slowly, as Iraqi security forces thoroughly screen the arriving civilians, especially men. “There are more coming. They're stopped at a checkpoint when they arrive and separated. The men are searched and then checked against a database,” Hashem said. Security forces expect IS members, especially non-combatants and those who did not hold any public positions, to try and mix with the refugees to slip out of the besieged city, an Iraqi intelligence officer told Reuters on condition of anonymity. Security forces rely on databases of known IS members, local informants, and their own professional flair. Up to 6,000 IS militants could be inside Mosul, according to Iraqi military’s estimates cited at the start of operations, Reuters reported. Iraqi army commanders claimed that some 3,300 have been killed in the battle for Mosul’s outskirts and the eastern part of the city so far.